Beth Ann & Jessica's Helpful Savings: Woot: Forever Lazy Lounge Outfit $3.99 - Garage Sale at Woot! Woot: Forever Lazy Lounge Outfit $3.99 - Garage Sale at Woot! Woot is having a garage sale. Go and get items at bigger discounts than before. 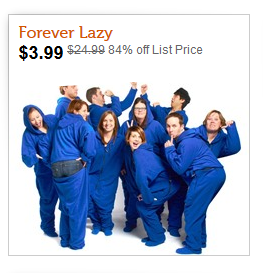 Right now, at Home.Woot, get Forever Lazy, a $24.99 value for just $3.99 (84% savings). Sounds like a good stocking stuffer to me!